The RHoMIS tool has been well documented in scientific publications, with an increasing number of papers and journal articles in the public domain. 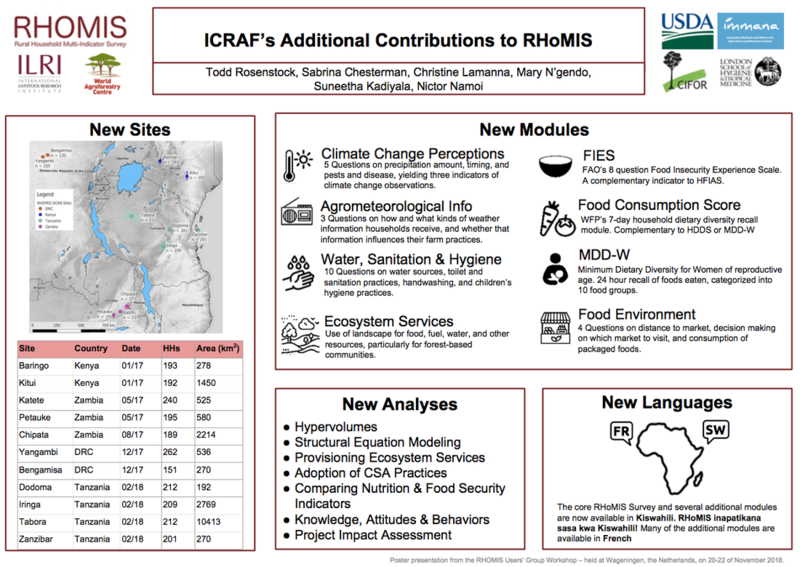 This highlights the valuable contribution that RHoMIS is making to science and to strengthen our understanding or rural households. Below, we include some highlights of RHoMIS research and RHoMIS-influenced publications. 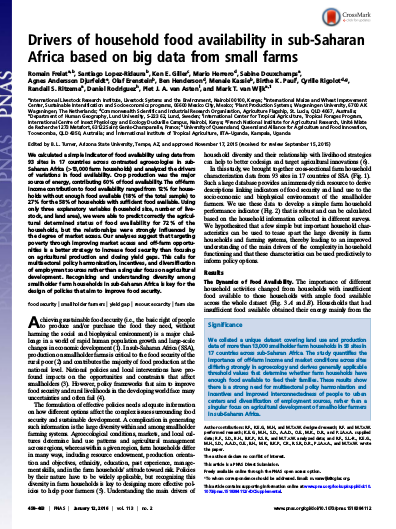 RHoMIS has been used in the publication of more than 15 science papers and articles. 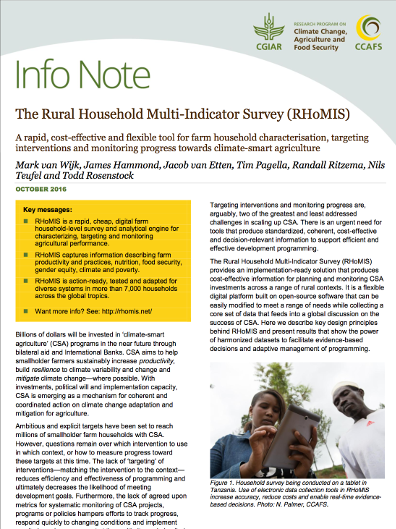 The Rural Household Multi-Indicator Survey (RHoMIS): A rapid, cost-effective and flexible tool for farm household characterisation, targeting interventions and monitoring progress towards climate-smart agriculture. 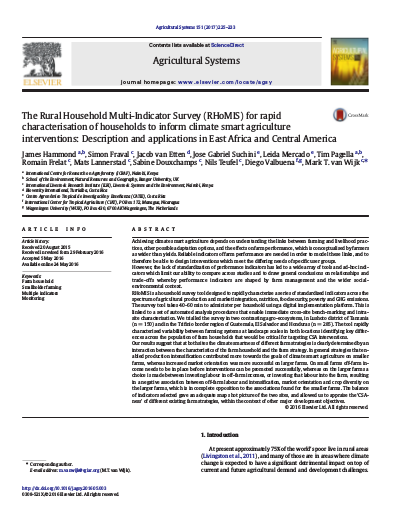 The Rural Household Multi-Indicator Survey (RHoMIS) for rapid characterisation of households to inform climate smart agriculture interventions: Description and applications in East Africa and Central America. 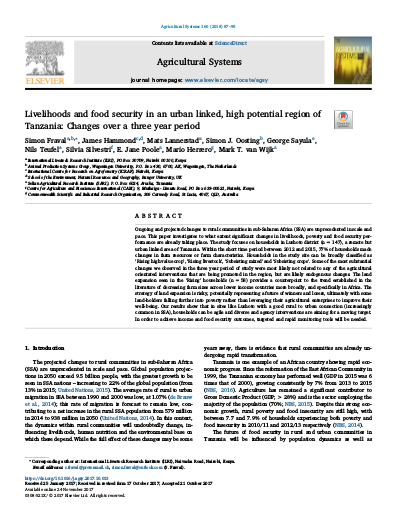 Livelihoods and food security in an urban linked, high potential region of Tanzania: Changes over a three year period. 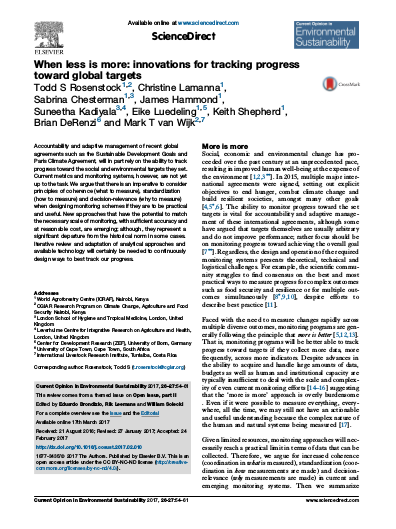 ​When less is more: innovations for tracking progress toward global targets. 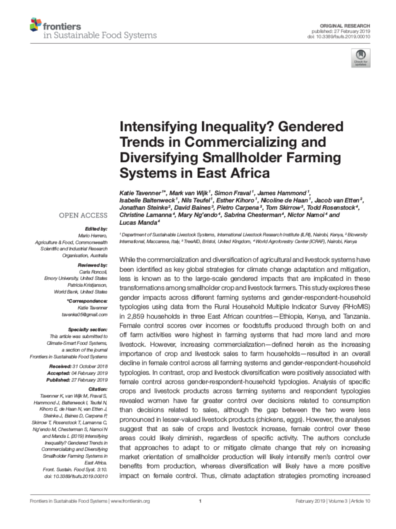 Drivers of household food availability in sub-Saharan Africa based on big data from small farms. 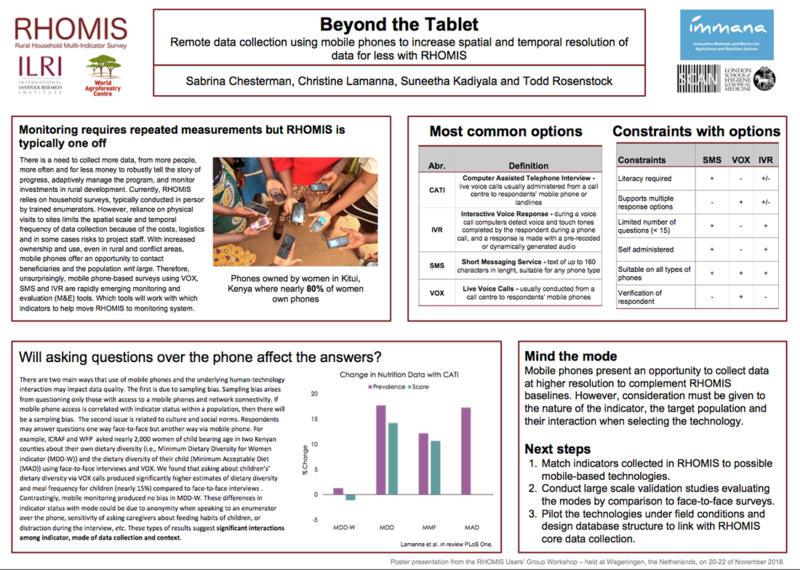 The following posters were submitted by users of the RHoMIS tool to showcase scientific application and outputs. 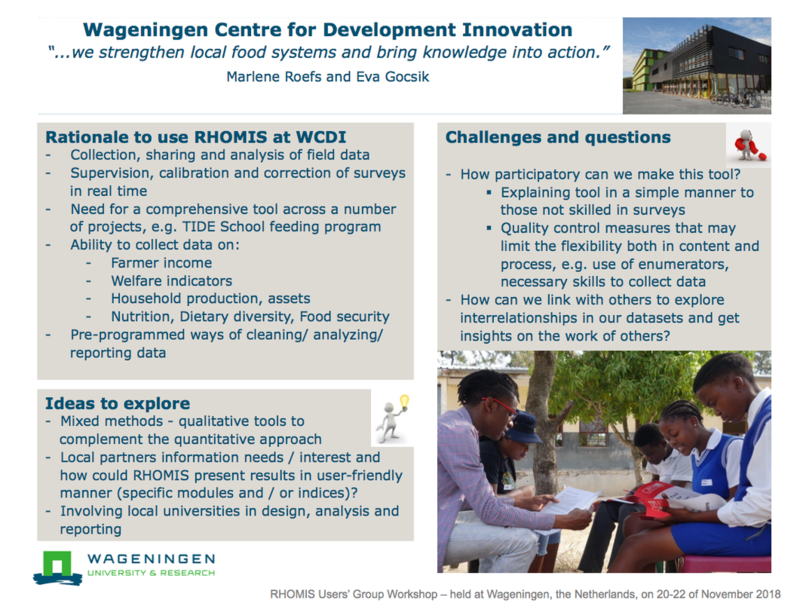 These were presented at the RHoMIS user's workshop held in Wageningen, Netherlands, in November 2018. 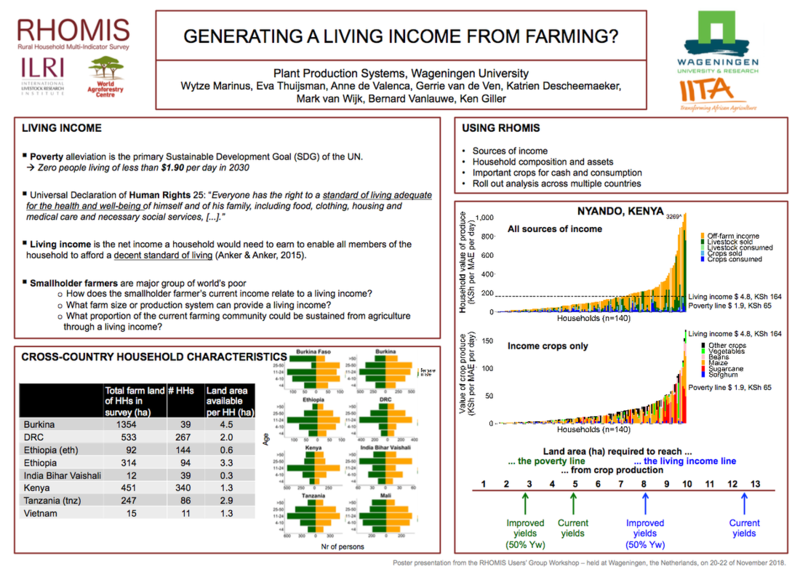 Generating a living income from farming. 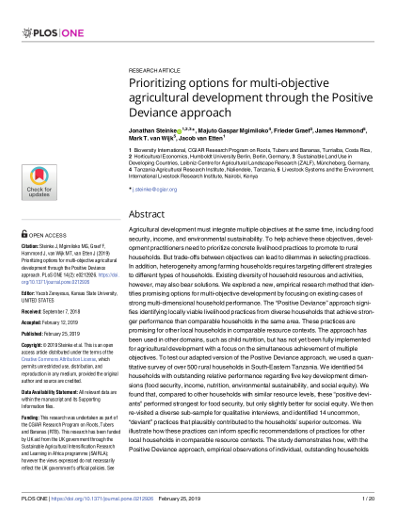 Plant Production Systems, Wageningen University. 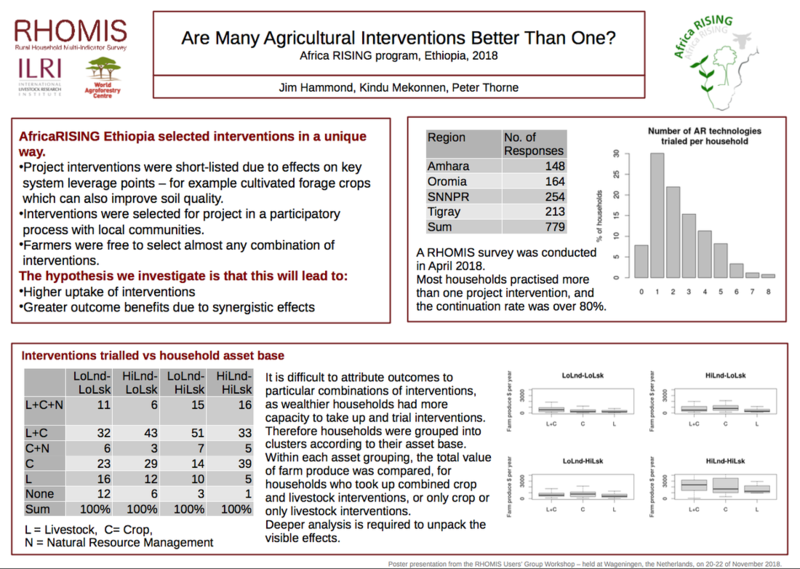 Are many agricultural interventions better than one? Africa RISING program, Ethiopia. 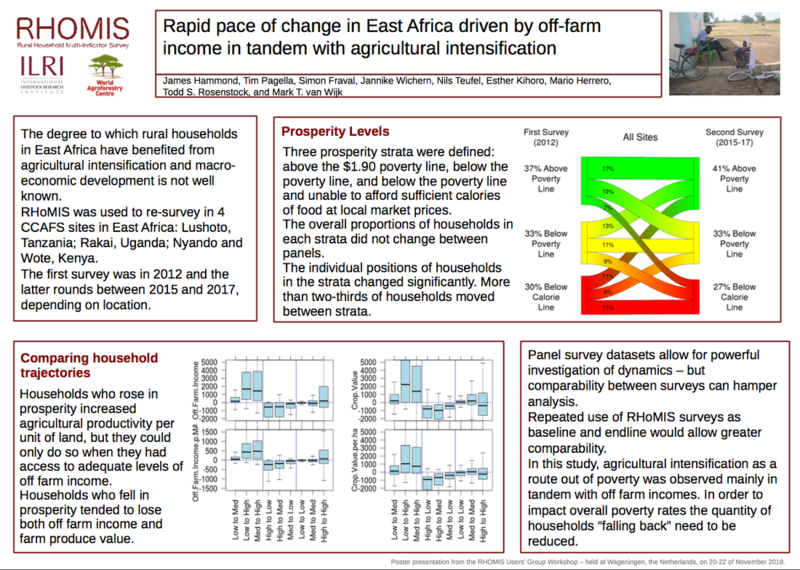 Rapid change in East Africa driven by off-farm income with agricultural intensification. 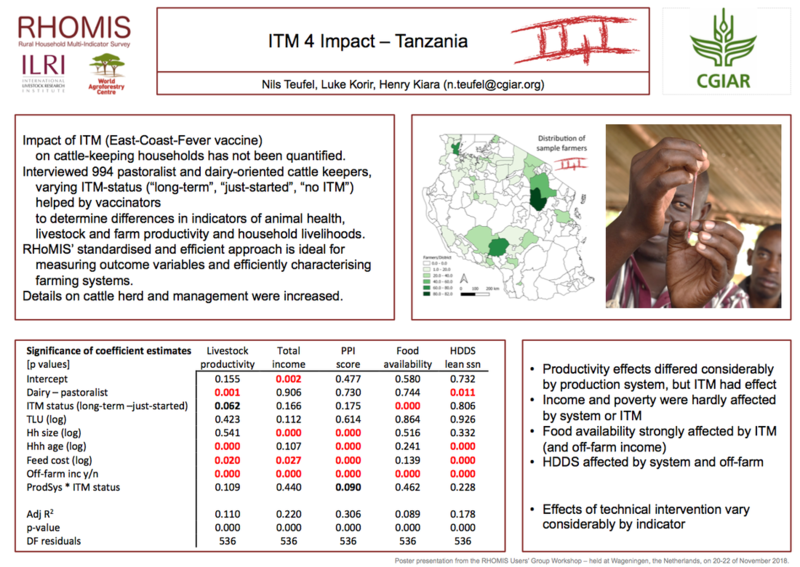 East-Coast-Fever vaccine for impact, Tanzania. CGIAR. 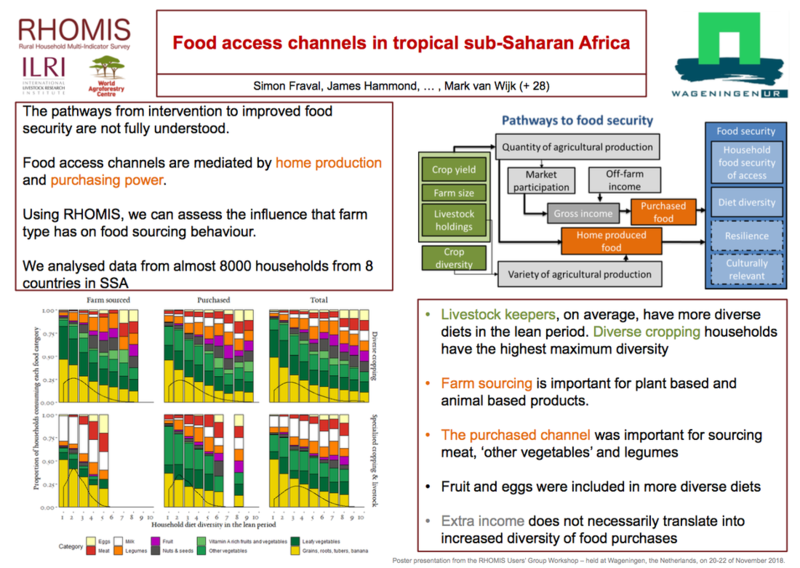 Food access channels in tropical sub-Saharan Africa. 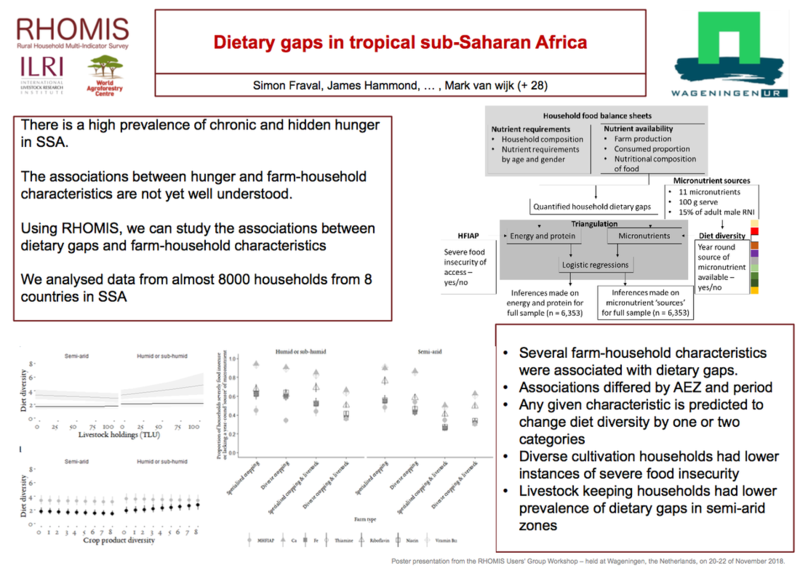 Dietary gaps in tropical sub-Saharan Africa. 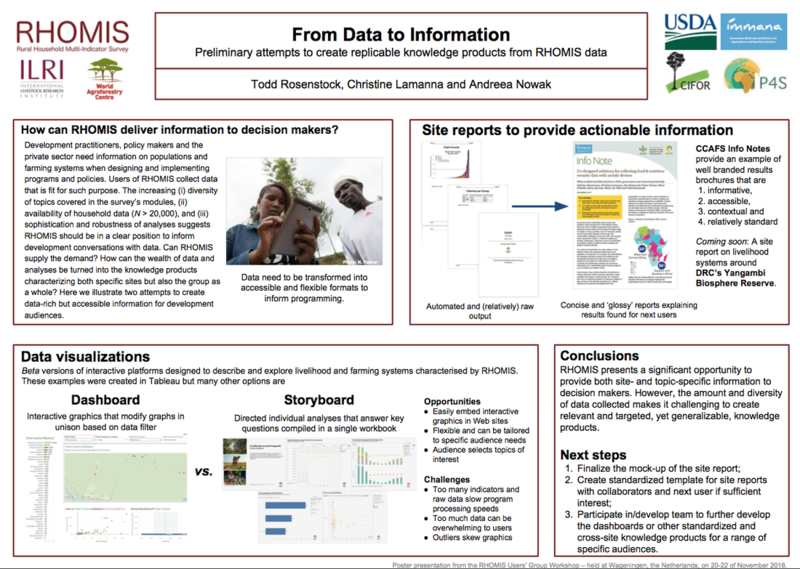 From data to information: replicable knowledge products using RHoMIS data. 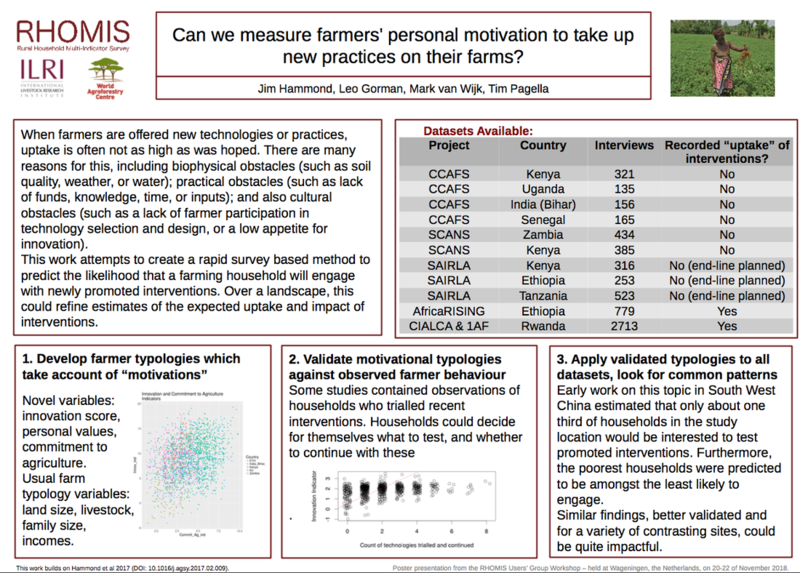 Can we measure farmers' personal motivation to take up new practices on their farms? 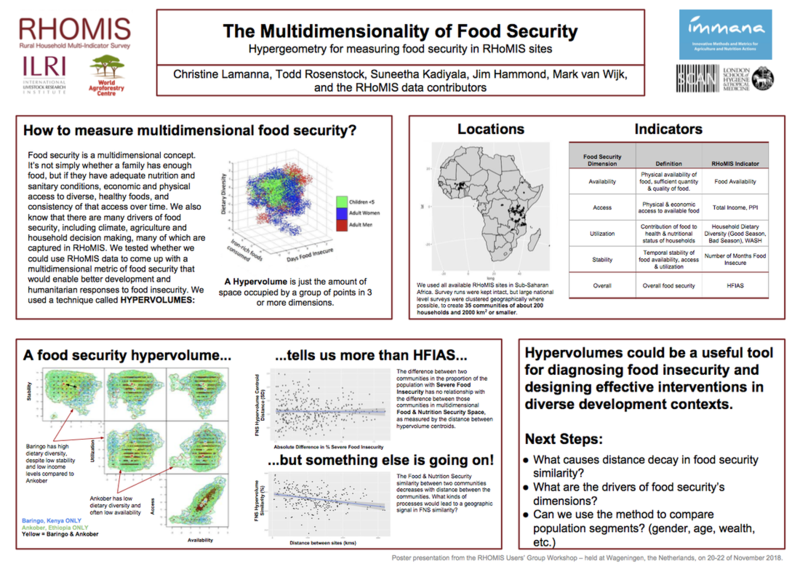 The multi-dimensionality of food security: hypergeometry for measuring food security. 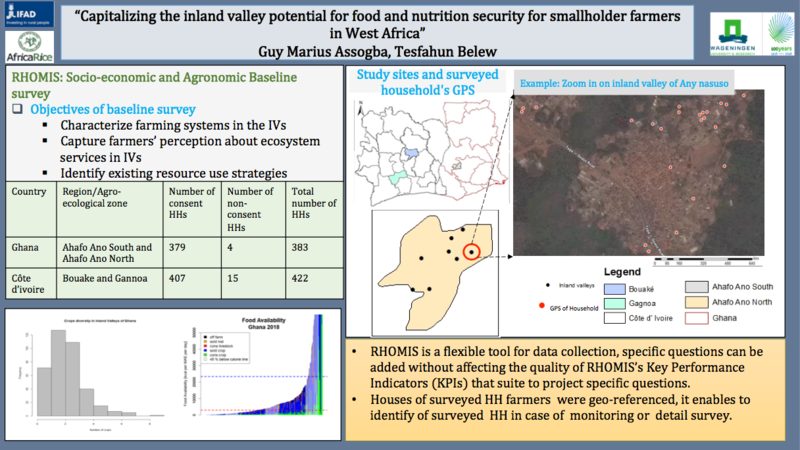 Capitalising inland valley potential for smallholder farmers in West Africa. 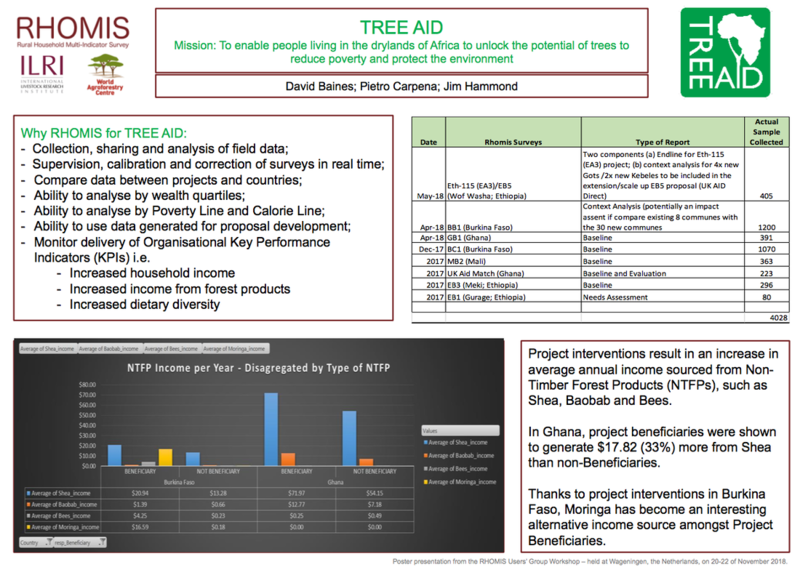 Use of RHoMIS by NGO: TREE AID's deployment of RHoMIS in West Africa. 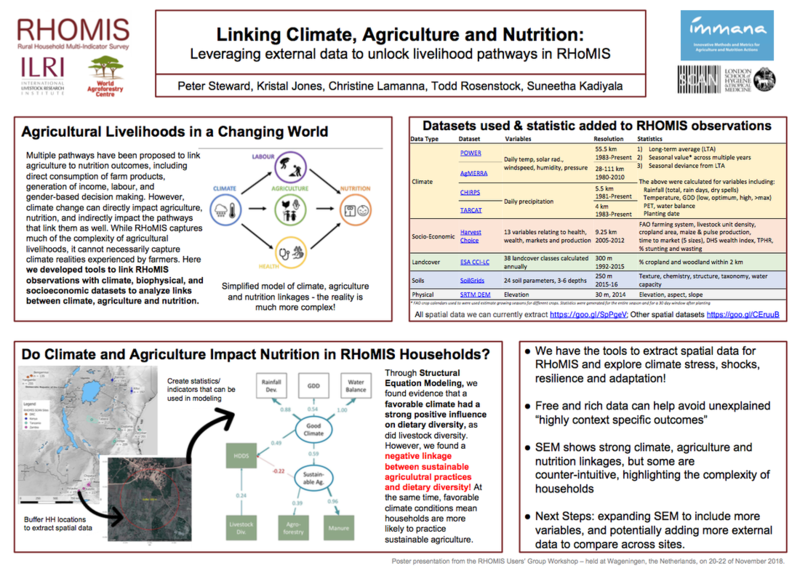 Linking climate, agriculture and nutrition: leveraging external data.